Growing up we ate pancakes quite often, and not just for breakfast. We were one of those lucky households that ate pancakes for breakfast, lunch or dinner and I thank my parents fondly for making that happen. However, our pancakes were not like the North American pancakes served on my friend’s breakfast plates. Instead of fluffy, airy and from a box, ours were made from simple ingredients and were thin and floppy. If we were lucky, there would be a lacy, crispy edge around each pancake and that was the part I’d eat first completely unadorned…no syrup just yet. Once I had nibbled around the crispy edges, the insides were eaten with jam, with cottage cheese and with 100% pure maple syrup (we were Canadian, after all). While my brother and I loved these pancakes, these were made for my dad through and through. My dad was from Eastern Europe and this was the kind of only kind of pancake he was familiar with. Anything else was just filler. When my husband and I went to Lithuania two years ago on a visit to my Fatherland, I got a taste of these pancakes again. Served with jams, soft cheese curds, and whipped cream, they were decadent and delicious. And a few weekend mornings ago, I got to thinking about those thin Eastern European pancakes and decided to try my hand at them. When my mom made these, she would throw all the ingredients into her trusty Osterizer blender and let it whirl, but this time I just mixed it by hand. I couldn’t tell a difference, they were just like I remembered them. Delicious. Instead of serving these with syrup or jam, I decided to use up those still lingering frozen strawberries into a sweet-tart sauce to accompany the pancakes. I made the sauce first and then let it cool while I made the pancakes. This was the icing on the already perfect cake. Any leftover sauce is perfect for swirling into yogurt or plopping into a bowl of Scottish oatmeal. 1. Whisk together the eggs, flour, sugar and salt together. Pour in milk and the oil and blend well until batter is smooth and runny. Set aside. 2. Start your sauce by adding chopped strawberries, orange juice and zest and sugar into a small saucepan. Bring to a boil and let the sauce reduce slightly. Turn down the heat and add in the cornstarch slurry and stir until combined. Let it cook further for another few minutes and then remove from heat. 3. Put oil in a large frying pan and slowly add in batter. When the top becomes dry, flip. Repeat with remaining batter until you have a lovely stack of thin pancakes. Divvy up the haul and generously pour strawberry sauce over top. We are a pancake-loving household, but I have never made crepes. I might need to rectify that soon. Yum awesome anytime meal for sure. Growing up my mom used to make waffles for dinner sometimes, which I of course loved. Actually I don’t know if we ever had waffles for breakfast.. I make these often; we call them pfannenkuchen or klettiten since they’re also made in Germany and Austria. We like ours with lingonberries, and I just scored 3 jars for $.99 each at the local Ranch Market – they’re $5.98 at our local German deli. I make a whole wheat version, too, and will soon be adding ground flaxseed to those to add even more fiber. Those look more like crepes and more my style. Traditional “American” pancakes are much too bread-y for my taste. Love the strawberry sauce! Yum! This looks really good. A nice lite treat for when the weather is getting warmer! Oh wonderful! I am an avid fan of crepes, but not with all the liquor, but rather jams, and cheeses. This reminds me of that so much. Looks wonderful! Those look so good! I have to try them soon! Oh yum! 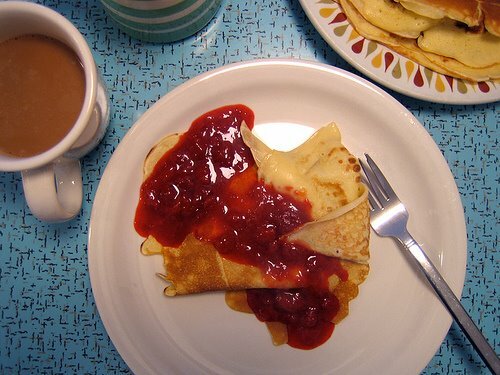 My Mom used to make us Danish pancakes (they look very similar) for dinner when we were growing up. I’ve been looking for a good thin pancake recipe and I have some lingonberries to use up. This might just be what I need! This is a good breakfast idea, especially for Mother’s Day! Or, what the heck. ANY DAY! I think creeps are amazing. which would be the same thing as thin pancakes. but they have to be made right. if there over done or under done there terrible. I just finished a restaurant menu design for a hole in the wall breakfast joint in the lake view neighbor hood in chicago. I came from a pancakes for any meal family as well, and have already gotten my hubby hooked on the trend. I’ve never ever put cottage cheese on mine though – I’ll have to try your favorite way! I just made these–SO good. I’ll never go back to making plain ol’ American pancakes. Just found your blog via David Lebovitz. That sucker is so awesome, huh!? Anyway, just wanted to drop you a line and tell you I like yo’ style! And keep on riding! Oh yes, Tara, you must change it immediately! Eatme, I never ate waffles as a kid (well, sometimes we did have “eggos”), I’m jealous. Cyndi, a ww/flax version sounds good! Dana, the strawberry sauce is awesome! Bijoux, make sure you/your husband also makes the sauce. It’s soooo good. Sarena, not sure how light it is 😉 but it’s good, real good. Lane, I think I like the term “creeps” better than crepes!! Indrajos, I’m jealous. Eat lots of blynai for me! Brie, try this out, it could be the one! Maris, these would would be perfect for Mother’s Day! Yay for pancake families, culinary. Trina, I bet you had a great time there! I loved it a lot. Kelcey, glad you loved them. Hooray, a convert!! oh Blynai! Yum! You’re making me a little bit homesick. 🙂 My Husband and I lived in Vilnius for a year back in 2003/04. 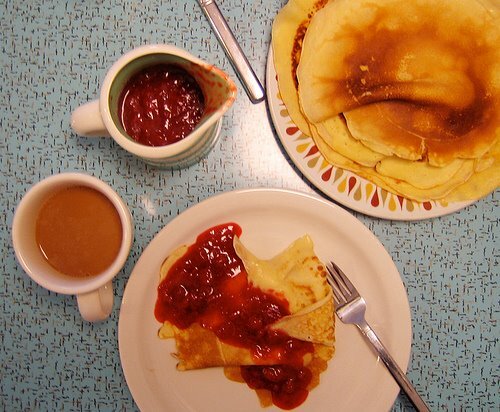 We didn’t have pancakes that often as kids, but when we did, they were this style, with honey or sugar and lemon or jam. I could eat a whole stack of these, especially with the strawberry-orange sauce. we used to eat pancakes for dinner too. I also have fond memories of my step-dad making batches and batches of crepes with lemon, butter and sugar for sunday brunch. yummy…your post has reminded me of all this…thanks! 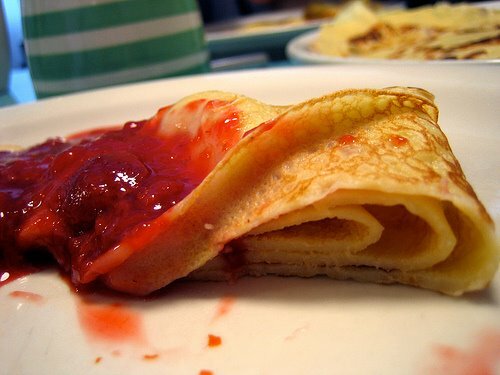 Growing up in New Zealand, thin pancakes where the only pancakes anybody made.. they were typically after school snacks with either butter and jam or lemon juice and sugar. YUM! how versatile a crepe could be… spinach and bechamel, chicken and vegies, whipped cream with shredded chocolate, orange marmalade, corn with white sauce, lemon juice and sugar, dulce de leche!!! Flavors from childhood…. These look lovely. I’m having a brunch for my brother’s graduation, and I think I’ll have to put these on the menu. Thanks for sharing! Daily Spud, with lemon and sugar these would be soooo good. Will try that! Catskillkiwi, okay, the lemon/butter/sugar has been salivating! Dolores, wow what a childhood! haha, Hefk, glad you loved these!